PBS Annual Meeting, Orlando, Fla, May 17, 2011 – As America’s largest classroom, PBS and WGBH along with other PBS member stations announced plans today to launch PBS LearningMedia, a new public media education platform available to every teacher and student across the country in time for the 2011-2012 school year. Bringing together the best available high-quality media from 1500 public media producers and more than 350 local PBS stations, PBS LearningMedia is a next-generation digital media platform for PreK-16 classrooms to help re-imagine classroom learning, transform teaching, and more creatively engage students. PBS stations are the number one source of educational media for students and teachers, at home and in schools, from coast to coast. Distributed by PBS member stations in every school district, the new digital media platform will deliver classroom-ready, high-quality content tied to curriculum standards, professional development courses, a robust content delivery system, and a flexible infrastructure designed for customization and seamless integration into existing services. 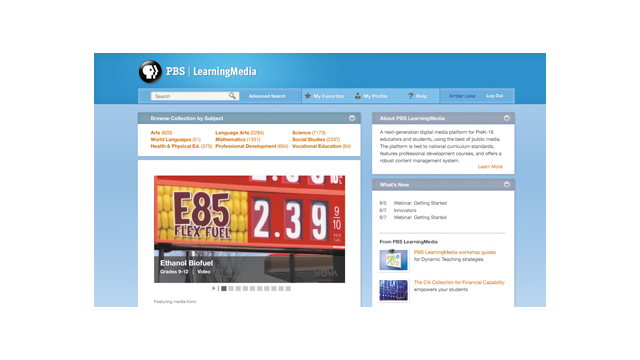 Including content from over fifty-five member stations, independent producers and public institution partners, the first phase of development for the new education platform will combine existing infrastructure models from the PBS Digital Learning Library with local services from WGBH’s Teachers’ Domain and its partners, WNET/New York and Kentucky Educational Television (KET). WGBH Boston is America’s preeminent public broadcaster, producing such award-winning PBS series as Masterpiece, Antiques Roadshow, Frontline, Nova, American Experience, Arthur, Curious George, and more than a dozen other prime-time, lifestyle, and children’s series. WGBH’s television channels include WGBH 2, WGBH 44, and digital channels World and Create. Local WGBH TV productions that focus on the region’s diverse community include Greater Boston, Basic Black, and María Hinojosa: One-on-One. WGBH Radio serves listeners from Cape Cod to New Hampshire with 89.7 WGBH, Boston’s NPR® Station for News and Culture; 99.5 All Classical; and WCAI, the Cape and Islands NPR® Station. WGBH also produces the national radio news program The World. WGBH is a leading producer of online content and a pioneer in developing educational multimedia and new technologies that make media accessible for people with disabilities. Find more information at www.wgbh.org.